Mixed masters eights sit ready at the catch. Photo by Lizette Gonzalez. Rowers donned in candy cane-striped leggings and Santa hats raced boats adorned with Christmas trees and red bow balls at the Marine Stadium Sunday for the 52nd annual Bill Lockyer Christmas Regatta. Hosted by the Long Beach Rowing Association, the event consisted of 850-meter sprints from a floating standing start. This year’s event ran from dusk to dawn, with over 500 entries in 112 heats. 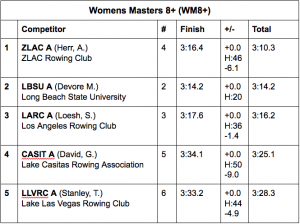 Long Beach State raced six heats— WN4+, WN8+, WO4+, MO4+, MM2x, WM8+, placing in each category. The women’s novice-four began their heat with a rough start, catching a crab within the first 150 meters; however, the four gained momentum, walking on the other teams during the sprint and placing in second. Vigorous winds and strong currents presented challenges for boats, pushing teams towards the rocks throughout the sprint. Despite the choppy water and strong gusts of wind, the women’s varsity-four had a good race and finished in second, toe to toe with ZLAC during the final strokes of the sprint. 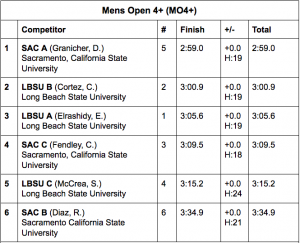 The men’s team raced three fours in the men’s open four heat late afternoon. Two of the three boats placed, taking home bronze and silver for Long Beach State. The four stroked by novice rower Christopher Cortez placed in second, followed shortly by the four stroked by fourth year varsity rower Ehab Elrashidy in third. 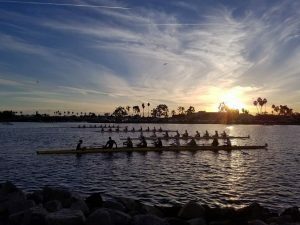 This year’s Bill Lockyer Christmas Regatta marks Long Beach State’s final race for the fall season. The men’s team will race next in the spring season at the UCLA Dual on Jan. 6. Tags: BCA, beach crew alumni, Christmas Regatta, lbsu, long beach rowing association, long beach state, rowing.